Teh tarik (literally pulled tea in Mandarin) is a hot tea beverage which can be commonly found in restaurants and outdoor stalls in Malaysia, Singapore and Brunei. Its name is derived from the pouring process of "pulling" the drink during preparation. It is made from black tea and condensed milk. 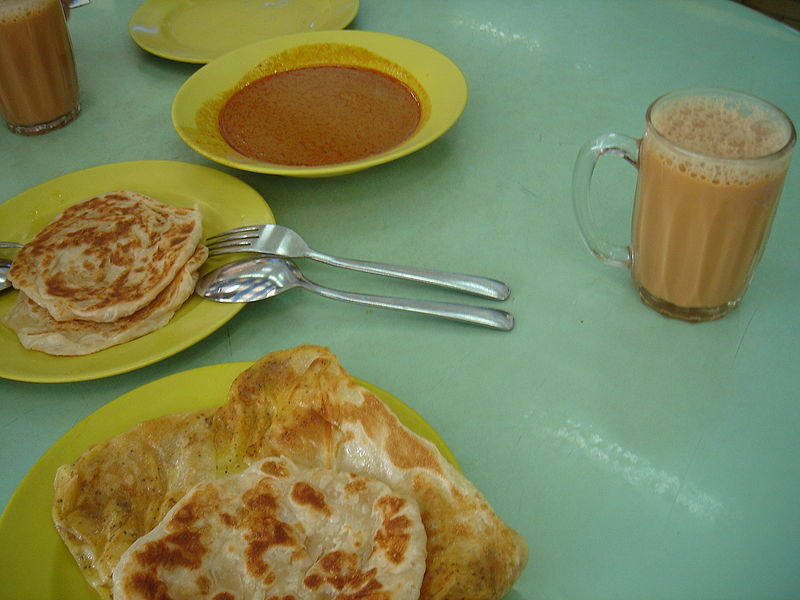 Left: Roti prata and teh tarik (Singapore). The mixture is poured back and forth repeatedly between two vessels from a height, giving it a thick frothy top. This process cools the tea to drinking temperatures, and helps to thoroughly mix the tea with the condensed milk. It is also done to give the tea a stronger flavour. An element of showmanship exists in the preparation of teh tarik. The ability to drag a long stream of tea well over their heads is an amusing novelty for the locals and tourists alike. In Malaysia, there are occasions where teh tarik brewers gather for competitions and performances to show their skills. Of late, teh tarik was recognized along with nasi lemak as part of the food and beverage heritage of Malaysia by the Malaysian government ministry.